We were so pleased that so many parents and grandparents joined us for our Phonics INSPIRE workshop yesterday morning! It was lovely for our visitors to see how we learn our new phonemes, graphemes and tricky words and to join in with our free- flow activities. On Tuesday 10th of November 2015 we (4 maple) went on a trip to Cadbury World in Bournville. We went as part of our chocolate topic. Firstly, we went to see the history of cocoa beans. I learnt that you have to have people out in tropical Rainforists so they can harvest them. Secondly, we went to see the history of Cadbury and we had a look at two different videos, but they were both about cocoa beans. We learnt that there were two men who had sons and they took over Cadbury. Next , we went out and found a little car ride it was called the Cadabra ride. We enjoyed the little cocoa beans all around but the best bit of it was the cave with the paintings at the end. After, we walked around the factory and we saw boxes going down a slide. The best bit was getting to taste the chocolate with popping candy and jelly babies. For representing the school so well. 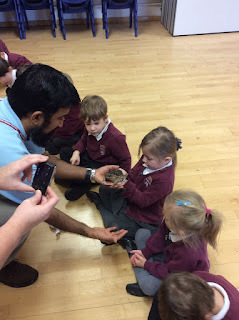 Reception's Visit from the Animal Man! 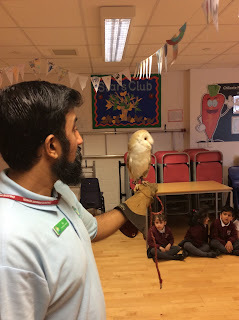 Today we were lucky enough to have a visit from Animals in Hands, where the children had the opportunity to handle a variety of animals. 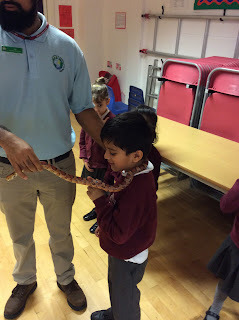 The children were able to get close to many animals such as a snake, a toad, a hedgehog, a cockroach, a tarantula and an owl. It was great fun! On Tuesday 17th November six children in year 4 and six children in year 6 represented Chilcote in a mixed gymnastics competition. The tournament took place at King's Heath Boys School in their sports hall. All of the children had to perform a gymnastics routine on the floor and then on the vault. They were scored by independent judges. The children were performing the Key Steps routine (year 4 did key steps 2 and year 6 did key steps 3). The children did really well with their performances and represented the school excellently. The year 4 children finished in fourth place out of five schools in their competition. The year 6 children finished in first place out of four schools, which was an excellent achievement! Well done to all of the children involved for representing the school so well!!! On Wednesday 4th November 2015 seven children from year 6 represented the school in a mixed handball competition. The tournament took place at Kings Heath Boys' Sports Hall. There were four teams in the tournament: Chilcote, Hollywood, Yardley Wood and The Oaks. Chilcote started off against The Oaks and won 5v0. They then played against Yardley Wood and lost 3v1. Next, they played against Holywood and narrowly lost 2v1. This left Chilcote in third position after the first round of matches. Again, Chilcote played against The Oaks and won 5v0. They then played Yardley Wood in a dramatic game that they went 2v0 up in then went 3v2 down in before coming back to win 4v3. Finally, Chilcote lost 3v1 to Hollywood. This meant (with all the other results too) that Chilcote finished in second place courtesy of having a better goal difference than Yardley Wood. Well done to all of the children involved for a fantastic effort!!! We had a very busy week during 'Out and About Week' last half term. In year 1 we took our Mathematics lessons outside into the playground and solved lots of number problems around the school grounds. We also used our hands and feet to measure items around the playground, which was lots of fun! Later in the week we went to Trittiford Park to evaluate the area. Back in the classroom, we discussed how the area could be improved and wrote letters to a local MP! The children know how important it is for us to look after our local area and keep it looking smart and clean and so we teamed up with different classes in the school and went on a whole school litter pick. Well done year 1 for some great learning and super team work!